Good morning! I hope you had a great weekend! This weather feels almost like Fall! I was scrolling through my pictures today and ran across these adorable lake houses. 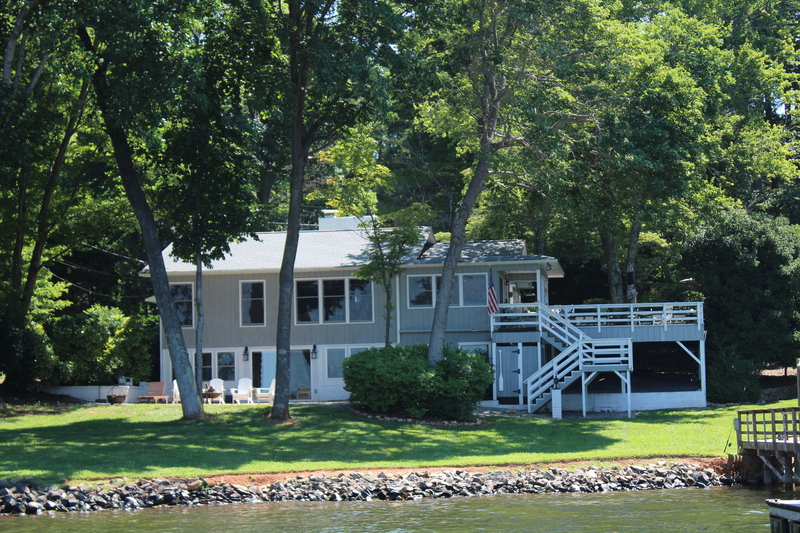 Do you love vintage lake house charm, too? Our lake is huge. It’s the largest man-made lake in the area with over 520 miles of shoreline. So, there are lots of places to explore and homes to see. It seems like every time we go out we find a new spot! Here are a few of our favorites: Wouldn’t you love to see inside? Some of the pictures I snapped are a bit far away. I wanted to take pictures of some cool older houses without invading the homeowner’s privacy. It saddens me that many of these homes will eventually be torn down and replaced with enormous houses. Of course many of these are lovely too. This place is spectacular! The picture really doesn’t do it justice. It’s gorgeous from every angle and has practically 360 degree views. Of course this house is our very favorite. Our house is directly off of the main channel so we get to do lots of people and boat watching. And this beauty comes by several times a day. We love her. If you ask us, our sunsets are unbeatable. Location, location, location. Happy Hill indeed. This is just a small sampling of the charming older homes on the lake and just some I snapped in one afternoon. My parent’s place is another beauty. They chose to add on to the original cabin to accommodate a master suite and a few guest rooms but were still able to keep the vintage charm of the original place. Their house is named “Little by Little”. It’s sweet, but the flat roof above the front door just collects water so we hope to replace it with a pretty portico. This will serve double duty. We hope it will give the front of the house a little more curb appeal while being more practical with drainage. The carport is off to the right with a covered breezeway to the house. We want to add garage doors and windows. So, this will be a major undertaking. Well, that AND a wedding! We hope to get a permit and get started as soon as we can. I’ll keep you posted on the progress. Meanwhile, we’ll enjoy Happy Hill as it is for a tiny bit longer. Vintage Doorknobs-How to add Vintage Charm to your Decor!